The new Adwords Enhanced Campaigns interface is being introduced to agencies over the next week with training webinars lined up from this Friday. Search meetings all week have been dominated by speculation over what the changes would mean. While all will presumably be explained and any loose ends smoothened out eventually, I started to put down a list of questions for myself that I thought I’d share here. Bear in mind, I’ve purposely stayed away from reading articles on the change outside of the Adwords blog or having speculative discussions with colleagues. So if some of the updates you’ve read on the internet this week have already addressed some of my questions please excuse me for that. Plenty of studies have highlighted how the 3 screens have different usage patterns … why then have PCs and tablets been combined. If intuitively I know that some campaigns are better suited to a particular device eg End Funnel terms convert better for PCs, how do I shift my weightage to favour one device if the budget is shared. Search managers have shied away from implementing too many separate mobile campaigns as everyone in the industry is time poor. With every keyword (anywhere between 10,000 to 80,000 in some accounts) now opted in to mobile by default, the required oversight and attention to detail has increased probably more than the savings expected by merging all device targeting. Does an individual keyword have a separate Quality Score for each device or a single one affected by performance (CTR etc) on each device? Will separate destination urls be assigned to the same keyword for PCs/tablets and mobiles to account for different domains eg full site vs m.site. Campaign managers have been adding unique parameters to urls by device so web analytics systems can differentiate and stack incoming traffic in dashboards. In the introductory post, Adwords mentioned that bid multipliers could be applied to have differential bids by device or other contexts like location, time of day etc. Will these multipliers be at the campaign level i.e. apply to every keyword in the campaign or can they be assigned at the individual keyword level. How long until 3rd party SEM management platforms used by large agencies, are ready to work with Enhanced Campaigns. Some platforms are yet to offer support for one-year old features like Adwords for Video. Presumably there will be separate sets of ads and site-link extensions (click to call, location etc) by device. eg if an advertiser utilizes branch phone numbers from his Google Places account for PCs but a nationwide 1300 number for mobile search phone extensions. Will there be an easy way to vary extensions by day-part, eg make phone extensions invisible post work hours when a customer service number is unmanned. Will separate reporting on site-link extensions be available by device. Will we ever get individual site-link reporting as well. Fingers crossed. Is Adwords for Video also going to adopt the compulsory mobile opt-in interface. With tablets largely used as a personal entertainment device, this is one landscape where I would strongly recommend tablets being separated from PC’s so in-search and in-stream bids can be set accordingly. When I create a display remarketing campaign with banners, is this also an all-device campaign. Should I create separate audience lists (one of mobile visitors and one non-mobile) and can I then use both in the one re-marketing campaign with separate creative. Well that’s my list I’ll be taking into the training session. If you’ve got any additional areas I’ve missed please ping me. All the best. After my post on Coca-Cola’s customised Coke can campaign, I stumbled upon (no pun intended) another similar campaign in the UK. Cadburys came out with a limited edition Dairy Milk +1 bar when it launched on Google+. 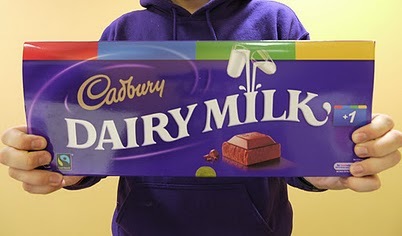 Users could get one of these 1kg bars by entering a competition to tell Cadburys what it should post on its page. The bars got a mention on the Google UK page and the pics spread a bit as these often do in the online space. 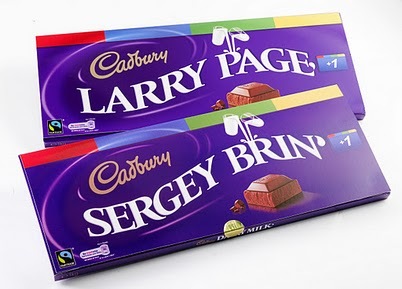 To follow up they created two special personalised ones with the names of Google founders Larry Page and Sergey Brin. Here’s a new commerical that Google started airing in the US over the weekend for its social network. The focus again is on the Circles and the ability to share by exclusion into specific circles of connections. While I recognize Circles and Facebooks lists as valuable nice-to-have privacy features I don’t think they are USPs for a social platform. Yes in real-life we do not share information and experiences freely with everyone but that’s because societal norms and inhibitions stop us doing so. In the online world we are more emboldened to upload pictures, announce our thoughts and post our location at a given time. I don’t agree Social Networking was broken to start with. What it needs is more innovation to keep its connected participants hooked. Google+ should focus on its stand out USPs like Hangouts and the now renamed Huddle rather than approaching the social space with a fix-it attitude. Here is the video below, tell me what you think.